Meet Caroline G. | Giveaway! My name is Carrie and I live in North Carolina. I'm a former preschool teacher turned business owner. After two years of teaching, and a year of running a business simultaneously, I realized my heart was way more into my business than it was into teaching. I loved all the children I had and the experiences I got, but it was time to leave. I now work full-time for myself and am slowly learning the ropes of the trade as I go. What made you interested in being a small business owner? I think its something I've secretly always wanted to do. I grew up making crafts and sewing. I remember at one point I taught myself how to sew teeny tiny teddy bears and I would spend hours with fabric, needle, and thread creating away. Also, I've always been over the top girly, so making bows, tutus, and all things frilly seemed to fit my personality perfectly. When did you open your shop? I opened my shop locally in March of 2010 and sold to friends, family, and craft shows. I launched the online store January 1st of 2011. Do you take any custom orders? I absolutely take custom orders. In fact they are some of my favorite things to do because I get to know the customer on a more personal level. I've designed custom bows to match school uniforms, family portraits, birthday girl outfits, and wedding parties. What's your favorite item that you've created? I have lots of favorites, but I think the double chiffon headband is my favorite at this point. What's the best piece of advice you have for other small business owners out there? Have faith in yourself and believe in what you sell. If you don't believe in yourself, why should anyone else? Also, don't be afraid to take risks. I'm very type A and not a risk taker, but the small risks I've taken have paid off and encouraged me to take bigger ones. Isn't she great!?! Well the wonderful Carrie, from Caroline G., is sweet enough to giveaway a $20 store credit to one lucky JFTB reader! Also? All customers can receive 20% off their purchase the month of July with code: JENNI20. Happy Shopping!! (1) Visit Caroline G. and tell us what you would use your store credit for if you win! Don't forget to come back and leave a comment here with your email address! (2) Become a Facebook fan of Caroline G. by clicking "Like"! - don't forget to come back and comment that you're now a FB fan!! (3) Become a Facebook fan of jenni from the blog by clicking "Like"! - don't forget to come back and comment that you're now a FB fan!! (4) Become a Twitter follower of @carolinegbows - don't forget to come back and comment that you're now a follower and leave your @ name! (5) Become a Twitter follower of @jennifrmtheblog - don't forget to come back and comment that you're now a follower and leave your @ name! This giveaway will end on July 29th at 11pm EST and the winners will be randomly selected and announced shortly after. Vote if you love giveaways! I would my credit towards a tutu for the kiddo! Facebook fan of Caroline G.! I love the single chiffon headband! I like Caroline G. on Facebook! I like your cute little face on Facebook! Aaaaand I follow your loverly blog! I would get the The Wedding Bow and the Double layered Multi-Colored Bow! I'm digging the headbands!!! Mama wanty! I like Caroline G on FB! I likey you on FB! I follow caroline on twitter! I follow your bloggity blog! I like the cupcake spike bow & the chiffon headband! I'd put my credit towards either a tutu or a chiffon headband. I'm a fan of jenni from the blog on facebook. 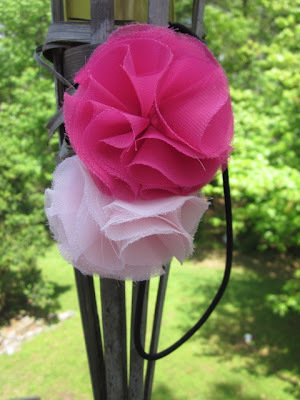 double chiffon headband or tutu...both adorable! I would use the credit for a double chiffon headband for my little girl! I like caroline g on facebook. I like jenni from the blog on facebook. i'm a twitter follower of jenni from the blog. Following, multiple daily views (aka stalking), same diff! i would get both brook & emmy a new chiffon headband. gorge! I would get a basic bow and a chiffon headband. I became a fan of Caroline G on facetious. I'm already a fan of yours on facebook. I already follow you on google friend connect. I love the cotton candy headband! I would use the credit for a tutu for my beautiful daughter! cute items! I would use teh credit for either a tutu or a headband...tough call! I would probably use the credit for a headband, but that tutu is pretty tempting! I'm the newest follower of your blog on GFC! I would get a couple headbands for my baby girl arriving in November! The bows and headbands are adorable! i liked caroline g on facebook!